This suburban city that is just north of the sizzling hot Atlanta metroplex is a popular place to stay when you are close to one of the nation’s busiest airports, and it is characterized by areas such as Riverside, Dunwoody Panhandle, and the Perimeter Center. 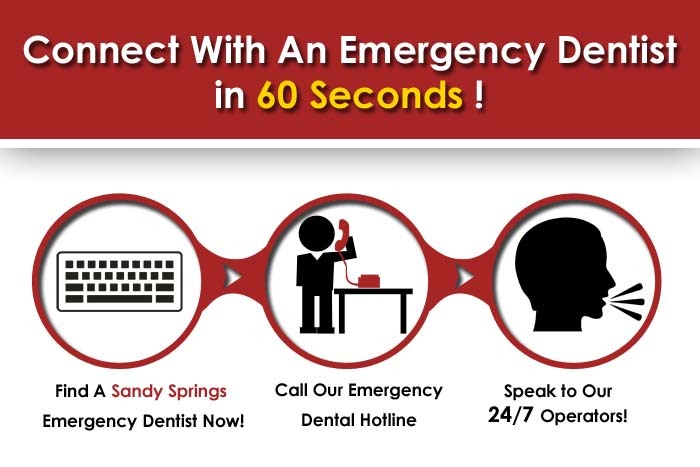 We have provided a great portal for you to locate an emergency dentist in Sandy Springs GA , if you are a frazzled business traveler or vacationer that suddenly realizes your weekend is altered by a nagging tooth pain, Sandy Springs GA is absolutely included in our after hours dentist network. If something happens and you are not able to reach any of these providers immediately, don’t hesitate to call our great hotline that also doubles as a referral service to quickly find you a Sandy Springs emergency dentist when your business presentation or trade show stay is threatened with the ultimate in personal travel nightmares: extreme front or rear tooth pain. We can rapidly provide you access to a late night dentist here in Sandy Springs. With attractions here like the Sandy Springs Artapalooza and the annual Stars and Stripes Celebration, there is plenty of live music, great eats, and open space just a touch outside of the metro for the whole family to enjoy. These Sandy Springs dentists are vetted by Emergency Dentists USA, and will be able to assist you when a dire need with emergency tooth pain befalls you. If you feel that your pain threshold is getting lower and your situation is getting worse by the minute, don’t wait too long, and call our emergency dentist care hotline! Description: It makes us happy that if you are in the scenic state of Georgia, you can call 24 hours a day, 7 days a week to our helpful walk in emergency dentist hotline. You may have a pain or abscess that you are curious about after normal business hours, or a full on injury that requires immediate extraction or a much closer look. Our skilled and seasoned partners have relationships with the best dentists in the area who are open when you most need them. Description:This team is available around the clock for any dental emergencies you may run into here, and is listed as an after hours dental clinic. Dr Michael Press has been engaged in private practice since 1976, and was a proud attendee of Emory University. He was a member of the medical staff for St. Josephs Hospital Atlanta, and is also a member of the Chicago Dental Society. Description:Johns Creek is a Sandy Springs dentist that can provide emergency extractions, same day service, and are known in the area for having a very welcoming setting and personal touch during your after hours dental care appointment. Head Dr Parsa graduated from the Medical College of Georga in Augusta and began working as a dental technician when he was very young. This is one area location that is a true specialist to serve you when an emergency strikes, and also has a top notch crown lab right on site. He chose his staff to be the best support that they ultimately could be, and they shine day after day when caring for patients with acute night dentist needs. Description:Life in and near Atlanta is anything but slow paced. You may find yourself having to deliver an epic Power Point presentation the next morning about ethics or financial stats, and may be struggling with dire tooth pain all of a sudden! This dental group is open on Saturdays, a rare find in the world of professionals who have grown accustomed to working substandard hours. Head dentist Katie McCann completed her schooling at the University Of Illinois Chicago College of Dentistry, and boasts externship experience with Salud Health Centers, rounding out her sphere of expertise fully. Sandy Springs is a great and thriving community just outside of Atlanta, with more than 300 restaurants, live music, and a heavy penchant for theater and art festivals. We want to be the accessible portal you choose to locate a 24 hour dentist Sandy Springs GA , because we understand you don’t want anyone in your family or yourself in crippling pain. If you want to find more out on a professional level about any of these before you schedule with them, you can visit The Georgia Dental Association .